To the untrained eye, the transparent blob in the Petri dish doesn’t look like much, but to former New York Sea Grant Scholar Marianne McNamara it’s a catch of the day—a gelatinous comb jelly that she can measure and even see what it had for breakfast. With NYSG funding, she and Drs. Darcy J. Lonsdale and Robert M. Cerrato of the School of Marine and Atmospheric Sciences at Stony Brook University looked at the rates at which comb jellies (the ctenophore Mnemiopsis leidyi) feed on the larvae of bivalves in Long Island estuaries. Could these gelatinous predators negatively impact efforts to restore important commercial bivalve species like hard clams? Long Island estuaries have historically supported an important commercial fishery for the hard clam Mercenaria mercenaria particularly in Great South Bay. After commercial landings as high as 700,000 bushels in 1976 there has been a significant and long-term decline in hard clam abundance despite reduced fishing pressure and ongoing restoration efforts. Clams in the larval stage are free swimming and subject to predation by jellyfish and finfish. In recent decades, Long Island and the region have experienced increases in ctenophore abundance. This may in part be due to localized warming of seawater and overfishing of the comb jelly’s natural predators such as the butterfish. 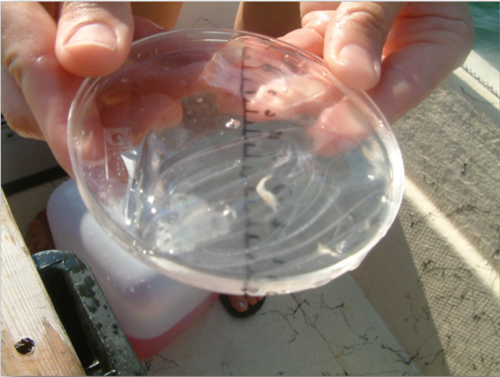 During the 2006 field season, the researchers looked at the ctenophore M. leidyi in LI’s Great South Bay and Peconic Bay. Sampling revealed that ctenophore abundance values were a factor of two to five times greater than previous studies conducted two decades earlier and that there were much higher densities of M. leidyi in Great South Bay than in Peconic Bay. The research team looked at the natural diets and feeding rates of M. leidyi on zooplankton in the two bays to determine mortality rates. By applying average daily ingestion rates the researchers calculated that at its highest densities M. leidyi can remove an overall average of 20 to 89 percent per day of zooplankton species including bivalve larvae (veligers) and other zooplankton such as copepods. Similar calculations showed that at high densities, populations of M. leidyi can potentially remove 94.1 percent and 58.5 percent of bivalve veligers per day in Great South Bay and Peconic Bay respectively. Although the peak population density of M. leidyi seems to come earlier in the season in Long Island estuaries, the timing of hard clam spawning events in Great South Bay has remained unchanged for at least 30 years: late spring and summer. The researchers provided data to show that hard clam spawning events took place during the time of peak ctenophore abundance in Long Island estuaries in 2006. This shifting ctenophore abundance has implications for top-down control of the entire plankton community. In his report to NOAA’s Community-Based Habitat Restoration Program entitled Restoring Hard Clams to Great South Bay, Carl LoBue, senior marine scientist at The Nature Conservancy, writes “Researchers (McNamara 2010) have found evidence that ctenophores have increased in abundance in Long Island estuaries over the past two decades and suggest that this could have implications for predation rates on bivalve larvae.” Says LoBue, “The researchers have generously been sharing information with us all along. It is generally known that due to predation pressure at early life stages of clams there needs to be bigger spawning events so that enough larvae and juveniles can escape predation pressure and survive to adulthood.” And surviving to adulthood is a key ingredient in the recipe for rebuilding the clam population.